SpaceX's Falcon 9 rocket and Dragon cargo capsule sit on the pad at Florida's Cape Canaveral Air Force Station ahead of a planned April 8, 2016 launch. SpaceX will try yet again to land its Falcon 9 rocket on a robotic ship in the Atlantic Ocean Friday (April 8). 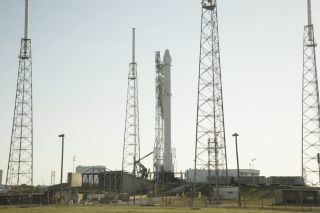 The landing attempt will come during the launch of SpaceX's robotic Dragon cargo capsule to the International Space Station (ISS) for NASA, which is scheduled to take place at 4:43 p.m. EDT (2043 GMT) from Cape Canaveral Air Force Station in Florida. You can watch the action live here at Space.com beginning at 3:30 p.m. EDT (1930 GMT), courtesy of NASA TV. Company representatives are optimistic that the fifth time will be the charm. "I certainly hope we're going to nail the landing this time," Hans Koenigsmann, vice president of mission assurance at SpaceX, said during a prelaunch briefing Thursday (April 7). Friday's launch will kick off SpaceX's eighth robotic resupply flight to the ISS, but its first in nearly a year. The company's previous such mission ended just minutes after liftoff in June 2015, when the Falcon 9 broke apart in the Florida skies. SpaceX traced the June 2015 accident to a faulty steel strut in the Falcon 9's upper stage. That problem has been addressed, Koenigsmann said. In addition, the company has since upgraded and modified the Falcon 9. Friday's liftoff will mark the revamped rocket's first ISS cargo flight, but it has launched on two other missions — in December 2015, and just last month — and performed well both times. Dragon is packed with about 7,000 lbs. (3,175 kilograms) of supplies and scientific hardware for this mission, including the Bigelow Expandable Activity Module (BEAM). BEAM will be attached to the ISS to test out the on-orbit performance of inflatable habitat modules, which offer much more usable volume per unit mass than traditional rigid, metallic structures, advocates say. "It is the future," Kirk Shireman, ISS program manager at NASA's Johnson Space Center in Houston, said during Thursday's briefing. "Humans will be using these kinds of modules as we move further and further off the planet and, actually, as we inhabit low Earth orbit." If all goes according to plan Friday, the Falcon 9's first stage will separate shortly after liftoff, and then perform a series of engine burns to head back to the drone ship, which is called "Of Course I Still Love You" and will be stationed off the Florida coast. Dragon, meanwhile, will continue toward the ISS, arriving there Sunday morning (April 10). Another private cargo spacecraft, Orbital ATK's Cygnus freighter, is already at the orbiting lab; Dragon's arrival will mark the first time both vessels have been at the ISS at the same time. The landing attempt is part of SpaceX's effort to develop fully and rapidly reusable rockets, technology that the company views as critical to opening up the space frontier. Indeed, SpaceX founder and CEO Elon Musk has said that reusable boosters could cut the cost of spaceflight by a factor of 100, perhaps making Mars colonies economically feasible. While SpaceX has not yet pulled off a drone-ship landing, the company has brought one of its rockets softly back to Earth. In December 2015, a Falcon 9 first stage touched down on terra firma at Cape Canaveral — the first time this had ever been done during an orbital launch.